June 25 marks the 480th anniversary of the presentation of the Augsburg Confession to Emperor Charles V. It is one of the confessional symbols that identify the Evangelical Lutheran Church and is like the Lutheran Church’s “birth certificate” because it summarizes what Lutherans believe and teach. It shows that the Lutheran Church is an apostolic church, and faithfully and genuinely teaches God’s Word and administers the Sacraments in conformity with Christ’s institution. Twenty-five years after Columbus discovered America (1492), Martin Luther nailed the 95 Theses on the Castle Church door in Wittenburg, Germany. This act, which occurred on October 31, 1517, was the “kick-off” for the Reformation. In the following years other groups arose opposing the Pope (Reformed and radical groups), but Luther and his followers could not come to agreement with them on a number of important doctrinal aspects. Meanwhile Emperor Charles V, ruler of the greater part of Europe, was seeking unity in his territories to demonstrate a common front against the Turkish advance on Europe. To that end, Charles wanted to end the religious discord that had grown since Luther. In 1530 he summoned all the princes and representatives to the Diet of Augsburg to discuss various issues and re-establish religious peace. His interests, however, were always more political than religious. The Lutherans already had at hand the Torgau Articles which dealt with the abuses and corrupt practices of the Church of Rome and the Schwabach Articles addressing various points of doctrine. Immediately upon arriving in Augsburg, however, they were confronted with the 404 Propositions Against the Lutheran Heresy written by John Eck, a Catholic enemy of Luther. The document cited Luther and Phillip Melanchthon out of context, making the Lutherans appear as Anabaptists and guilty of committing every other existing heresy. Therefore the Lutherans resolved to prepare a new document. This document, based on the two previous documents, would demonstrate the harmony between the Lutheran teachings and the early church, and distinguish Lutheran teachings from other Protestant ideas, especially those of the Anabaptists. Thus the Augsburg Confession, written in a conciliatory manner with respect to the Catholics, emphasized the points of agreement with Rome, though clearly noted the differences and abuses. Philip Melanchthon was the principal writer. 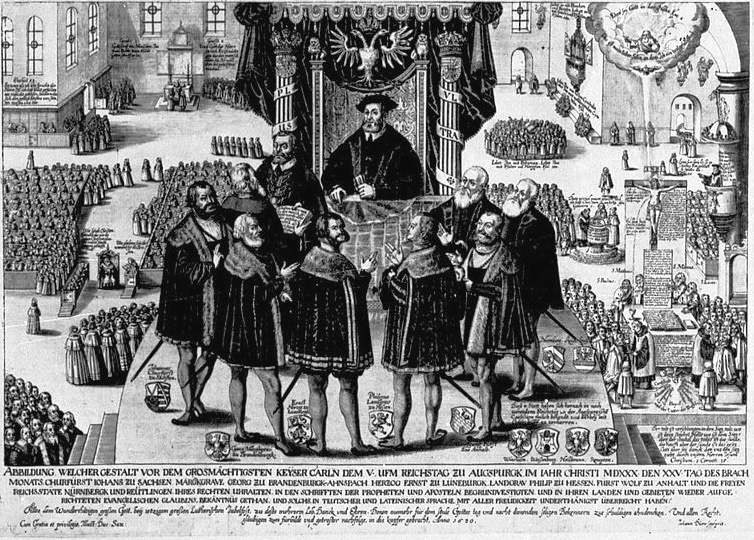 The Augsburg Confession was signed by the Lutheran princes and read before the Diet of Augsburg on June 25, 1530. The document contains 28 articles. Articles one to twenty-one present fundamental biblical doctrines. Articles twenty-two to twenty-eight treat some of the more serious abuses that were current in the Roman Catholic Church and which the Lutherans had corrected among themselves. Noteworthy are the doctrine of original sin; salvation and justification by faith alone; the role of Word and Sacrament; a proper understanding of good works; a correct understanding of the Church and its rites. The Augsburg Confession has a friendly and conciliatory tone. Truth and love, respect for authority, and yet the courage to confess the faith in the face of mortal danger converge in this document. This teaches us to proceed in the same manner today: loving the people, but never renouncing the truth simply to “get along” or for one’s own benefit. Some matters treated in the Augsburg Confession refer to situations current at the time of its writing. But, in its essence, the situation today is not much different. For this reason the Augsburg Confession has maintained its importance throughout the centuries. It is like a banner that unites us and a rampart that defends us against error. It serves as a base and as an example for the proclamation and confession of our faith today; for seeking the clear witness of God’s truth and opposing, with courage and firmness, the abuses that continue today, not forgetting the ingredient of love along with truth. Rev. Dr. Jose Pfaffenzeller is the director of Evangelical Lutheran Church of Argentina’s Seminario Concordia in Buenos Aries. (Translation by Rev. Ronald Abresch, Peace/Trinity, Trail/Fruitvale, B.C.) This article appeared in The Canadian Lutheran, May/June 2005.